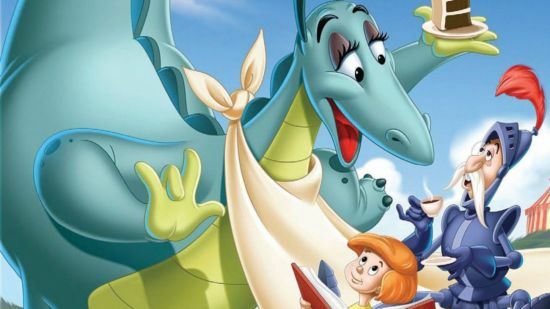 This is The Reluctant Dragon Story for kids. One evening, long ago, a shepherd ran home, terrified. “I saw something terrible,” he cried to his wife and son. “It’s as big as four horses. It has long, sharp claws, a long pointy tail, and shiny blue scales all over its body.” His son looked up from his book. “That sounds like a dragon,” he said. His parents got scared but the boy wasn’t scared. The next day, he set off up the hill to find the dragon. “He might be friendly,” thought the boy. The dragon was friendly and he was thrilled to see the boy. The boy smiled and sat down and asked the dragon all kinds of questions. Also, read Dumbo- The Flying Elephant Story. The dragon told stories of long, long ago. “There were dangerous dragons everywhere. And brave knights fought them to rescue Princesses,” he told the little boy. The boy came back every day to hear the stories. But then, the villagers found out about the dragon. They were terrified. The boy ran straight to the dragon and said, “The villagers want to get rid of you!” “But I would not hurt even a fly,” said the dragon. That afternoon, the boy heard even worse news. Saint George, the dragon killer was there to fight the dragon. Immediately, the boy rushed back to the dragon. “Saint George, the dragon killer wants to fight you,” gasped the boy. “And he has the longest spear I’ve ever seen.” “But I don’t like fighting. I’ll just hide in my cave until he goes away,” said the dragon. “You can’t! Everyone wants a fight!” cried the boy. The dragon yawned. “I’m sure you’ll think of something,” he said. You may also like to read, Lambert The Sheepish Lion. The boy walked slowly back down to his village. A crowd of villagers was telling about the dangerous dragon. “He eats ten sheep for breakfast! He burned down five houses,” roared the villagers. “It’s not true!” said the boy. “The dragon wouldn’t hurt a fly!” “But everyone wants a fight,” said George. “What can I do?” “Follow me!” said the boy and he took George to meet the dragon. “What a perfect place for a fight,” said George. “No fighting!” said the dragon, firmly. “Not even a pretend fight?” asked the boy. “Maybe…” said the dragon. The boy turned to George, “Do you promise not to hurt him?” “Well, it has to look real,” said George. “Will there be feast afterward?” asked the dragon. “There will, and you can come,” promised George. The next morning, lots of villagers arrived to watch the fight. The boy waited nervously by the dragon’s cave. They cheered and waved when Saint George rode into view. Soon, a roar echoed through the hills. Flames filled the air. Everyone gasped as the dragon appeared. His scales sparkled and his breathed out fire. “Charge!” cried George. He galloped hard, his spear held high. The dragon bounded up and they shot past each other. “Missed,” yelled the crowd. Also, read Disney Bambi Story. And he led the villagers, the boy and the dragon back down the hill. The boy was happy because his plan worked. The villagers were happy because they’d seen a fight. George was happy because he’d won. But the dragon was happiest of all. He had lots of new friends and a full tummy. “Jolly night it’s been,” he murmured and began to snore. “How will I get him home?” said the boy. “I’ll help,” said George. He gave the dragon a prod and they set off up the hill arm-in-arm – the saint, the dragon, and the boy. Also, read Lady And The Tramp.